I like using whole wheat noodles because you don’t get that bloated feeling like white noodles. 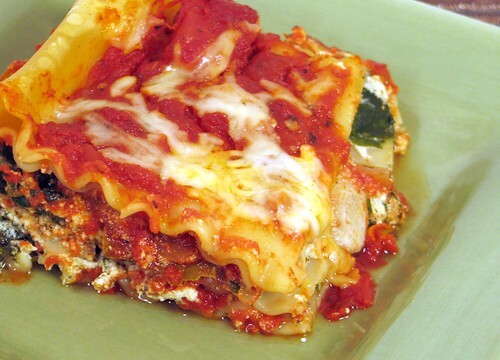 I have yet to find whole wheat lasagna noodles that don’t need to be boiled first. But surprisingly it isn’t hard at all. Knock on wood, I have yet to screw it up yet. Just be careful not to cook the noodles too long because they will get soft and start to break apart. Also, once the noodles are strained…lay them out to separately to dry RIGHT away because they will stick together. When I first made this recipe, I read the instructions wrong and mixed the “filling” and “sauce” together in the saucepan instead of layering them separately. Woops…but I found it a lot easier to assemble the lasagna by having one “filling” rather than two. This recipe was inspired by Rodale Recipe Finder. It was also a boyfriend approved meal. To make the sauce, add the oil and garlic to a saucepan at medium heat and cook for about 2 minutes until golden brown. Add the tomatoes, paste, and herbs. Simmer covered for about 10 minutes. To prepare the filling, add oil and onion to a frying pan at medium heat to cook for about 3 minutes. Add mushrooms and stir for 5 minutes. Toss in the garlic, cooking for another 2 minutes. Add chopped spinach, and cook until wilted (about 4 minutes). Season with salt/pepper. Mix the filling and sauce together in the sauce pan. Preheat oven to 375. Grease a 9x13" glass pan and begin assembling lasagna starting. There will be three layers. #1 - sauce, noodles, ricotta, mozzarella, sauce. #2 noodles, ricotta, cheese, sauce. #3 noodles, ricotta, sauce, cheese. Cover dish with aluminum foil, and bake for 40 minutes. Remove the cover and cook for another 10 minutes.